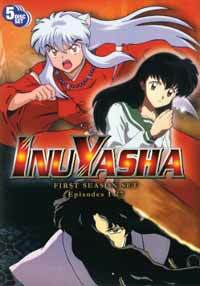 Related Series: Inuyasha movie 1-4, Inuyasha: Final Act. Also Recommended: Ranma ½, Zakuro, Chrno Crusade. Notes: Based on the manga by Rumiko Takahashi, published by Shogakukan Inc. 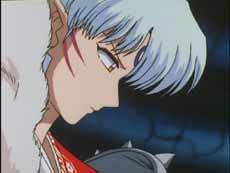 In an attempt to steal the Shikon no Tama, the jewel of four souls, Inuyasha is shot by an arrow against a tree, putting him in a deep sleep for the next fifty years. 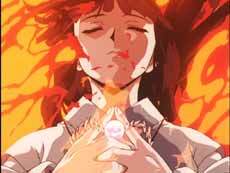 The priestess sealing him, Kikyo, dies after the sealing and is buried with the jewel. Leaving the feudal era, a school girl named Kagome is taken through the well of souls by a centipede demon looking for the jewel. 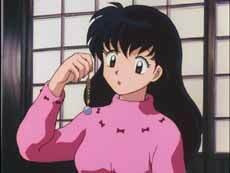 When taken to the feudal era, Kagome escapes and ends up at the tree where Inuyasha is sealed. Enemies at first, the two eventually forges a truce once the jewel is shattered, the pieces flying off in all directions, and the two have to track them all down. 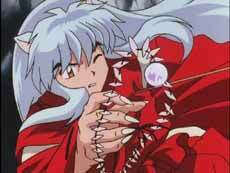 It's actually kind of scary looking back at my time with Inuyasha. It's hardly the oldest show I've watched -- Galaxy Express 999 predates it with twenty years -- but it's still more than ten years since this show first aired. 13, to be more specific, and it wasn't THAT much later when I started watching it myself. Admittedly, starting off on the singles wasn't the brightest idea either, because Inuyasha requires some dedication from the viewers. Running in at 167 episodes, there's quite a lot of material to get through. I know the jewel of four souls shattered into quite a lot of pieces, but Inuyasha still found some time to throw in some filler here and there. Those of you who read my original review (well, my second version -- the first one was a bit... overenthusiastic) might remember me mentioning being a bit of a Takahashi fan. Admittedly, this was partially due to the Ranma 1/2 manga being among the first manga I ever read, and it took my comedy bone with storm. I would later embellish this list with Mermaid Forest, but, true to be told, my list of watched stuff by Rumiko Takahashi is a bit... sparse. That said, if there's one thing I'm still standing behind, then that would be my opinion about this show. Granted, Inuyasha does settle into a "monster of the week" groove at times, but unlike many of its contemporaries, like Bleach or One Piece, Inuyasha is actually a love story first and a fightstravaganza second. Which brings us to the first niggle about Inuyasha: in many ways, it's more a rethread of Ranma 1/2 than a completely original show. Sure, it takes place in feudal Japan for the most part, but a lot of the characters are startingly similar, a fact that hasn't been lost on whoever chose voice actors, both in the original and in the dub. For instance, Inuyasha himself is basically Ranma with dog ears, and as such, both of them are voiced by Kappei Yamaguchi in Japanese and Richard Ian Cox in English. Curiously enough, Kikyo shares Akane Tendo's Japanese voice, while in English it's Kasumi's. (Go fig.) But even if they're not sharing voices, you can still see Ryoga Hibiki in wolf-demon love rival Koga, Ukyo Kuonji in Sango the demon hunter, and somewhat more strangely, Happosai in Myoga the flea. And Kagome? She's a significantly less violent Akane. Which is a plus, I guess. What makes Inuyasha compelling enough for a casual evening view, though, is simply its main plot, with various relatively non-complicated story revelations the show wisely portions out at carefully spread moments during the search for the jewels. 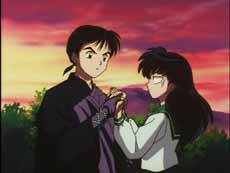 Among those, the most important one is the love triangle when you eventually learn that the priestess who sealed Inuyasha to the tree at some point was in a budding relationship with him. 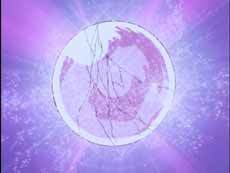 However, due to a betrayal from an old wounded bandit who ended up making a deal with a bunch of demons, their trust in each other are shattered, which lead to the opening event in this very show. Also quickly introduced to the main story is Inuyasha's half brother Sesshoumaru, who at first is looking for his father's heirloom sword, the Tetsusaiga, originally left for his halfling son in the graveyard hidden somewhere. 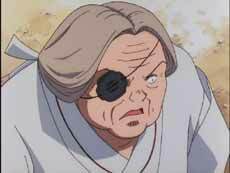 We learn some more about Inuyasha's family (later to be embellished on -- somewhat unofficially, mind -- in the third movie), most notably Inuyasha's mother, who was a human, and therefor not Sesshoumaru's favorite addition to the family. But the most common foil of a character in this show is probably Koga, the wolf demon. He kind of falls in love with Kagome (it's debatable, since his initial interest is mainly her ability to detect shikon shards), and quickly becomes the show's sole instigator of Inuyasha jealousy scenes. I would have been fine with this, though, except for one thing; his introduction is his tribe attacking a village and killing the inhabitants down to the last man, woman and child! You know... for food? And he has the nerve to show up for revenge when Inuyasha and the gang stop them by killing only the ones who refuse to run away. (Which, if memory serves me right, might have been a wolf or two. Tops.) And they call Sesshoumaru cold and murderous? The guy never killed anyone for no reason at all... or anyone who didn't attack him with the intent to kill. The guy who, let me remind you, rescued one of Koga's tribe's victims/early morning snacks and allowed her to travel with him and his goblinservant Jaken. Out of a morbid case of the interests, sure, but that still beats out "picking her out for an appetizer". One thing I really liked about Inuyasha is that the anime's art is a really nice transfer from the original manga. Even moving from TV series to movies to Final Act, Inuyasha's art is pretty consistent. Animation tend to vary quite much from season to season, but that's to be expected when a show crosses the 100 episode border and even starts looking longingly towards 200. The dub is also generally quite good. Richard Ian Cox does of course make for a good Inuyasha. He should -- after all, he's had more than enough practice by being Ranma. Moneca Stori impresses less as Kagome, though. However, she was new at this game at the time, and she improves considerably as the show goes along. More curiously, David Kaye, whom you might remember as the occasionally slightly hysterical Soun Tendo from Ranma 1/2, plays Sesshoumaru, Inuyasha's dark-voiced pretty-boy brother whom quickly made a fan of most, if not all, of the female viewers of this show. And the music? It's made by Kaoru Wada, who first impressed me with his score for 3x3 Eyes, and his work is actually more than up to scratch here. I just wish I had something positive to say about the opening and ending themes, all of which fits to Wada's wonderful score like a spike mat to the nuts. I'm not saying the songs are awful -- in fact, quite a few of them are very good -- but it just... doesn't mesh very well. And I will get into this in my review of Final Act, because... well... you'll see. All in all, I have to say that Inuyasha has aged remarkably well. The love triangle meshes greatly with the gem shard hunt, and new plot threads are introduced regularly without complicating the plot overly much. And, amazingly enough, the show isn't 90% battles and 10% preparing for the next set of battles. It's 80% battles, 10% talking about what they just did in said battle and 10% preparing for the next battle. Recommended Audience: Both people and monsters die in this show en masse. Most of them die without shedding as much as a drop of blood, though, and even the ones that are literally sliced in twain just dissolve in a shower of sparklies. Which is quite the departure from the manga, where many die quite messily. Also not in the anime: the numerous naked boobies. You have to read the manga for that.